Estonian folk power-trio Trad. Attack! take traditional songs – sometimes starting with scratchy recordings of long vanished village voices – and build pulsating rhythmic structures, creating an impressively big sound from acoustic 12-string guitar, drums and an array of flutes, bagpipes and jew’s harps. 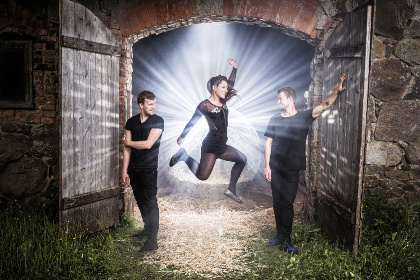 All three grew up with traditional music and had each been active on the Estonian music scene for several years when they banded together in 2014. From the outset it was meant to be fun and experimental. They prepared five songs and put out a self-produced EP which became a surprise local hit. In the ensuing upward momentum they’ve won 13 Estonian Music Awards, had their 2015 debut full album, Ah!, praised internationally and toured 21 countries from China to Canada. They’re still a bit surprised but definitely having lots of fun.